Swirling marble textures and painterly drips add a surreal touch to the landscapes created by artist, Kate Shaw. Her work epitomizes the other-worldly scenic trend we’re seeing develop for A/W 19/20. A Détacher interprets this trend by layering images of paillette sequins with photographs of craggy rocks and deep water for a primordial feel. To create this look, try inlaying painterly textures within mountain-scapes, then mirror the scene to form a watery reflection. 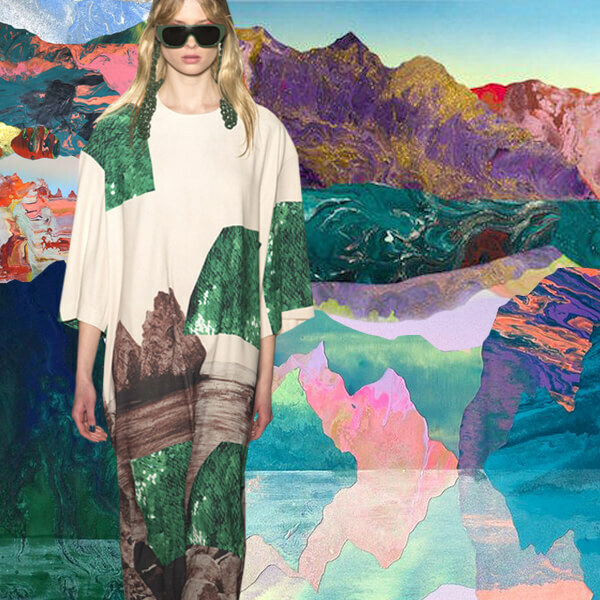 Share your creations on instagram by tagging them with #surrealscenicAW19 and we’ll post our favorites.